Xybix’s Eagle height-adjustable sit to stand imaging desks will help you achieve better health by giving you the ergonomic performance you deserve. Knowing that your ergonomic needs are taken care of, will allow you to focus on the job at hand. Caring for your personal health means that our desks can help you feel better, perform more accurately and leave work feeling accomplished. Having a secure and durable imaging desk that will provide height adjustment for the widest range of users’ means that your health needs will be cared for long into the future. Rest assured your imaging desk is uniquely suited for your specific preferences. 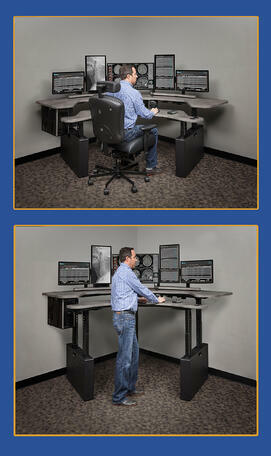 With customized options and accessories, Xybix’s Eagle imaging desks are what you’re looking for. Xybix Imaging desks are made specifically for Radiologists. Xybix's technology features can help you be more productive. Explore all Xybix's features and learn more.